The FTD® Faithful Blessings™ Bouquet is an incredible way to celebrate a communion, confirmation, or wedding, as well as send your sympathy for the loss of a loved one. 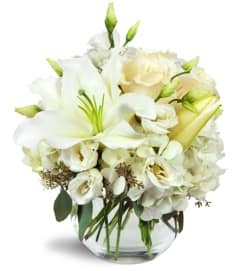 Bringing together stems of fragrant Oriental Lilies, boasting multiple blooms on each stem to create a full and lush flower bouquet, this offering of flowers will bring peace and beauty to any of life's special moments and occasions. 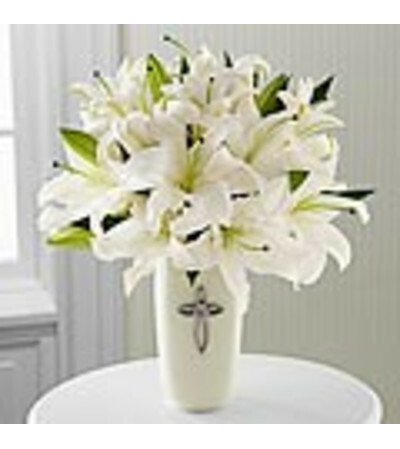 Presented in a keepsake designer white ceramic vase with a stunning cross on the front, this exquisite flower arrangement exudes heartfelt blessings with each eye-catching, star-shaped lily.